Will perovskites hold the key to spin-based quantum computing? Researchers from the Energy Department’s National Renewable Energy Laboratory (NREL), quite accidentally, discovered that perovskite materials, grown using solution processing, exhibit the optical Stark effect at room temperatures. The NREL team used the Stark effect to remove the degeneracy of the excitonic spin states within the perovskite sample. The optical Stark effect can be used to create promising technologies, including the potential to be used as an ultrafast optical switch. In addition, it can be used to control or address individual spin states, which is needed for spin-based quantum computing. Researchers from MIT and colleagues from the US, Germany France and India discovered that when you combine a topological insulator (bismuth selenide) with a magnetic material (europium sulfide) you create a material that one can can control its magnetic properties. The new material retains the electronic property of the topological insulator and also the full magnetization capabilities of the magnetic material. The researchers were surprised by the stability of that effect - in fact the material exhibited those great properties at room temperatures, which means that this hybrid material can be used to create spintronics devices. Researchers from the U.S. Naval Research Laboratory (NRL) developed a new type of room-temperature tunnel device structure in which the tunnel barrier and transport channel are both made of graphene. In this new design, hydrogenated graphene acts as a tunnel barrier on another layer of graphene for charge and spin transport. The researchers demonstrated spin-polarized tunnel injection through the hydrogenated graphene, and lateral transport, precession and electrical detection of pure spin current in the graphene channel. The team sasy that the spin polarization values are higher than those found using more common oxide tunnel barriers, and spin transport at room temperature. 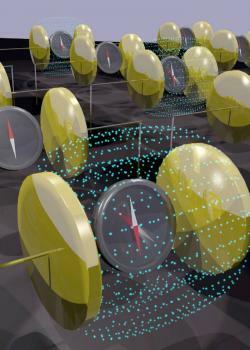 Researchers from the University of Utah have managed to control and read spin information at room temperatures. 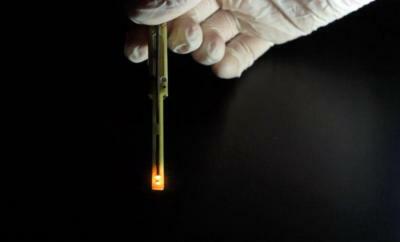 For this experiment, they used an orange OLED device. The researchers were able to read the nuclear spins of two hydrogen isotops: a single proton and deuterium (a proton, neutron and electron). When the researchers controlled the spin, they controlled the electrical current in the device. 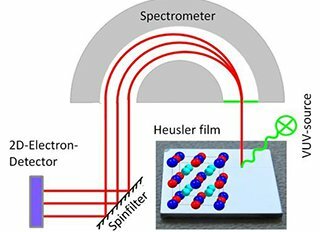 Researchers from the Johannes Gutenberg University Mainz (JGU) managed to directly observe the 100% spin polarization of a Heusler compound. A Heusler alloy is made from several metallic elements arranged in a lattice structure, and the researchers used the compound Co2MnSi. This paves the way towards using Heusler materials for spintronics devices. Spin polarization is the degree of parallel orientation of the spins of the electrons that transport the charge. 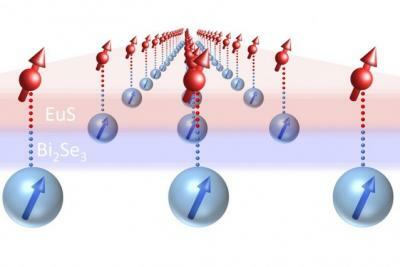 The ideal spintronics material has the maximum possible spin polarization. The Heusler alloy used in this material was shown to have an almost complete spin polarization at room temperature.